María Teresa Ronderos as the director of the Open Society Program on Independent Journalism, oversees the support for the protection and the production of high quality journalism that engages with audiences and communities and elicits the kind of critical thinking that any society that aims at remaining open requires. María Teresa comes to the Open Society Foundations from Semana, Colombia’s leading news magazine, where she served in a range of senior editorial roles. Together with the Ideas for Peace Foundation, she has been the creator and editor-in-chief of VerdadAbierta.com, a website covering armed conflict in Colombia. She is the author of the bestselling book on the subject, Guerras Recicladas for which she was awarded the Simon Bolivar National Award for “Journalist of the year” in 2015. María Teresa serves on the boards of the Garcia Marquez Iberoamerican Foundation for New Journalism and the Columbia School of Journalism Cabot Awards. María Teresa has trained professional Latin American journalists and led workshops, online courses, and seminars on investigative journalism, politics, and economic issues. 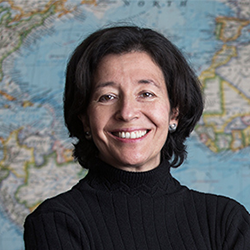 María Teresa has received the King of Spain Iberoamerican Award, the Columbia University Maria Moors Cabot Award and was a 2012 visiting fellow at Harvard University’s David Rockefeller Center for Latin American Studies. Ronderos was the chair of the panel GLOBAL ROUNDUP: How news organizations are using satire online around the world at ISOJ 2018 on Saturday, April 14 @ 11:15 a.m.